"...Diana is safely back at home, where her mortal remains can be cared for, and where her memory lives on forever"
Althorp has been home to the Spencer Family since 1508. On 6th September 1997 the Park became the focal point for the World’s attention, when Diana, Princess of Wales was laid to rest there after her tragically early death. She now lies on the island in the Round Oval, an ornamental lake, surrounded by her Family’s ancestral heritage. Next to the mansion at Althorp, with its magnificent art collection, lies the honey-stoned Stable Block; a truly breathtaking building that is perhaps of greater external beauty than the House itself. This is the setting for the centre for visitors, opening in Summer 1998, which will house an exhibition celebrating the former Lady Diana Spencer’s life and honouring her memory after her death. The freshness and modernity of the facilities will be a unique tribute to a woman who captivated the world in her all-too-brief existence. Produced by EMAP Online's A2btravel.com. Please note that some of the facilities described here are planned and not yet constructed. 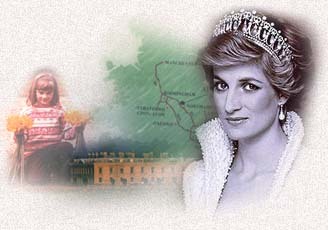 Althorp cannot accept responsibility if certain changes are made before 1st July 1998.